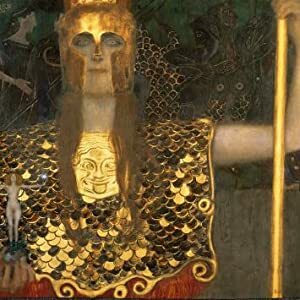 For young artists and art historians: Art Masterclass with Gustav Klimt (Brownridge) – Joyce's mystery and fiction book reviews with some non-fiction too! This book is part of a wonderful series from Wide-Eyed Editions. 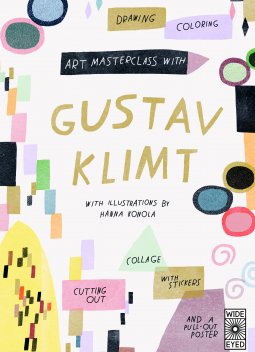 In this entry about Gustav Klimt there are ample opportunities to learn about the artist and his way of creating; the reader then can create their own works using their knowledge. The beginning of the book lists the tools needed to complete the projects; I loved that the artist’s eyes and learning to look was included. Klimt’s biography is given. The reader learns of how he wanted to break away from tradition to make his own art. 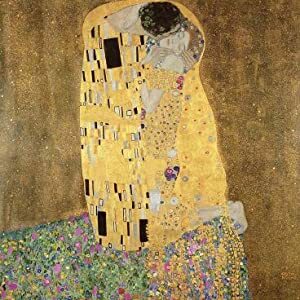 The reader will find that shapes and gold were important to Klimt and will find out why. In terms of projects, there is the chance to create pictures and even to use stickers. I think that this series provides such an appealing entree to learning about art. I can’t wait for the next volume. Many thanks to NetGalley and the publisher. All opinions are my own. Klimt was very clever at filling his pictures with patterns. He liked the way that by covering a person in a cloak of pattern, they would look flatter and more decorative. He saw patterns in everything, he was also inspired by his father who was a decorative metal engraver. Some people thought that the decorative arts weren’t as important as fine art paintings. 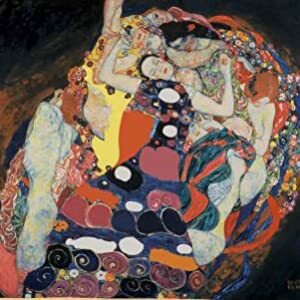 When Klimt borrowed collage and pattern techniques from the decorative arts, people were shocked. The paintings Klimt made during his ’golden phase’ are some of his most famous and well-loved. He didn’t travel much during his lifetime but he did visit Venice and Ravenna in Italy. It was here that he saw amazing, golden Byzantine mosaics that inspired his use of shimmering gold. This is one of Klimts’s best-known works. It is called The Kiss. The warmth of the gold makes you think of a warm hug. The only way you can tell which piece of cloth belongs to which body is by the patterns that Klimt has painted on top of the gold background. The man’s cloak is decorated in rectangular patterns and the woman’s dress is covered in circular patterns.